George W. Roy Recreational Park is a 28 acre park built with a partnership between Shelby County and the City of Calera with a 1/2-mile asphalt lit walking trail around it. It also has a playground and pavilions for family gatherings and birthday parties. 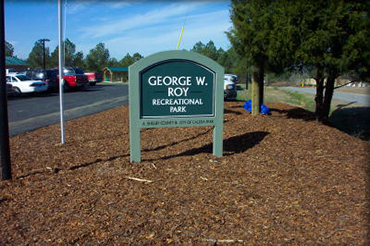 George W. Roy Recreational Park was built in 2004 and dedicated to our longtime Mayor George W. Roy in appreciation for his many years of dedicated service, devotion, and commitment to our city. George Roy Park is located at 2465 2nd Avenue, Calera, AL 35040. Calera Parks & Recreation © .